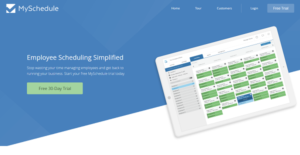 MySchedule is a workforce management and scheduling application that takes the burden of managing your employees off your shoulders so you can focus on your business more. The system comes equipped with the tools and functionalities to help you create and implement employee schedules quickly and efficiently. Employees can access their schedules via MySchedule’s website or through the mobile application. That means they can easily view their schedules through the internet or via their smartphones and tablets as well as submit their requests, thus eliminating the need to call in to the office or set up a meeting. Communication is further improved between managers and their workforce. The system can function as a board for administrative announcements and updates while employees can communicate with fellow employees without opening an external communication app. Making and implementing schedules for your employees should be effortless and that is what MySchedule is all about. This user-friendly workforce management and scheduling tool helps business managers create the perfect schedules, enabling them to fully utilize their available manpower, assigning their employees to shifts that best help them achieve their business goals without overloading their employees with work. Everything is web-based, meaning both managers and employees can access MySchedule via web browsers, smartphones, and tablets. This added flexibility ensures that all parties are in the same page when it comes to scheduling. Once a schedule is completed, everyone is notified of their shift through their mobile apps. With MySchedule, employees can easily view their schedules through the platform and be notified of any changes and update in real time. They will also love how they are able to interact with other employees and discuss and propose shift swaps without ever having to exit the system and open up an external messaging application. Announcements can be effortlessly conveyed via the system as well. Employers will definitely appreciate MySchedule’s reporting and insight tools. Being able to view critical information in the most understandable way (via harts, graphs, and data), employers create better and more fully optimized schedules that will suit both them and their workers, decrease operational costs dramatically while ensuring maximum profitability. What Problems Will MySchedule Solve? 1) You no longer have to run your company off of excel spreadsheets. Availability and conflict detection are built into the application. You can save your favorite schedules and load them in seconds with the click of a button. 2) No more phone calls from employees during the days and nights asking questions about the schedule. Everyone has access to their schedule 24/7 via the web and phone app. 3) You can communicate with your team in real time. Send out messages and announcements to your entire staff in seconds. If you are considering MySchedule it may also be a good idea to check out other subcategories of Best Employee Scheduling Software collected in our base of SaaS software reviews. Every business is different, and might need a particular type of Employee Scheduling Software solution that will be designed for their company size, type of clients and employees and even individual industry they support. We advise you don't count on getting a perfect app that will work for every company no matter what their background is. It may be a good idea to read a few MySchedule reviews first and even then you should pay attention to what the solution is intended to do for your company and your employees. Do you require an easy and intuitive app with only elementary functions? Will you really make use of the complex tools required by pros and big enterprises? Are there any specific features that are especially beneficial for the industry you work in? If you ask yourself these questions it will be much easier to find a reliable solution that will fit your budget. How Much Does MySchedule Cost? Contact MySchedule directly to learn more about their enterprise pricing information and other product details. A 30-day trial period is also offered for those who want to take MySchedule for a spin before making a decision. We realize that when you make a decision to buy Employee Scheduling Software it’s important not only to see how experts evaluate it in their reviews, but also to find out if the real people and companies that buy it are actually satisfied with the product. That’s why we’ve created our behavior-based Customer Satisfaction Algorithm™ that gathers customer reviews, comments and MySchedule reviews across a wide range of social media sites. The data is then presented in an easy to digest form showing how many people had positive and negative experience with MySchedule. With that information at hand you should be equipped to make an informed buying decision that you won’t regret. What are MySchedule pricing details? What integrations are available for MySchedule? MySchedule integrates with a number of POS systems. Contact MySchedule to know more.